We source from around the UK and across the globe, but no matter where we source from all our suppliers have one thing in common. They all meet our ethical and environmental standards and are happy to be constantly checked against them. 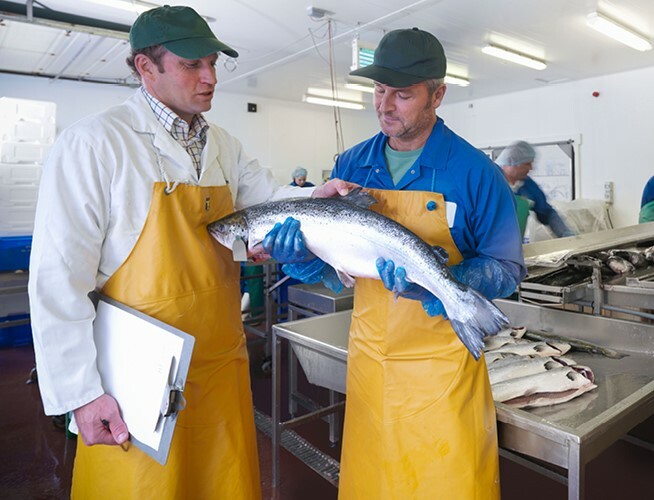 British fish and seafood: We buy more British fish and seafood than any other food-service supplier. We love British fish so much, we have geared our whole UK distribution network to take advantage of British daily landings. We can deliver native fish and seafood throughout our branches within 24 hours of it being landed. To find out what has been landed this morning, get in touch, or better still sign up to Skipper’s Catch. Farms and fisheries: Fish Farms (also known as aquaculture) are an important source of our fish and seafood. Having national and global suppliers means we can keep you in stock of certain seasonal species throughout the year and make sure your customers’ favourites are always on the menu. Of course we only work with the best. Ones that can demonstrate they are not negatively impacting on the environment and ones that look after their stocks in responsible way. Wild capture fisheries: Wild capture fisheries are suppliers that hunt in the seas for their catch. Their catch is varied and uncertain but like all our suppliers they have to live up to our high standards of responsibility (no matter where in the world they are). We work with organisations like the Marine Stewardship Council to make sure they don’t over fish at risk species and responsibly manage by-catch. Given our reach, we understand our responsibilities and have a zero-tolerance approach to modern slavery. For more info read our full statement regarding modern slavery and human trafficking in SE Asia Seafood Industry. Governments, United Nations... we'll work with anyone who takes responsible fishing practices as seriously as we do.